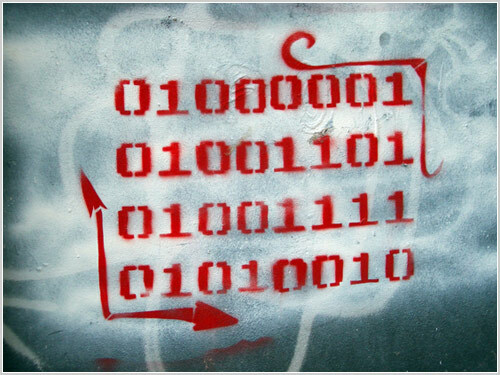 There is a lot of geeky graffiti out there. Some are just scribbles on a wall (programmer art being as it is), and some definitely qualify as artwork. 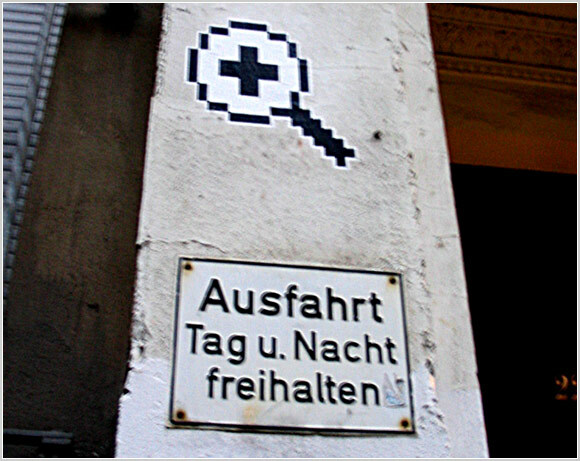 It’s no secret that we here at Pingdom are geeks ourselves, and we had a “geek graffiti collection marathon” the other night where we found some really cool pictures from around the world. We have narrowed it down to 13 pictures, all with some relation to IT or the internet, that we thought we would share with you in this post. If nothing else, it’s proof that geeks drink other things than just Jolt Cola and Mountain Dew. This was scribbled on a wall in the men’s toilet in a bar in Australia. 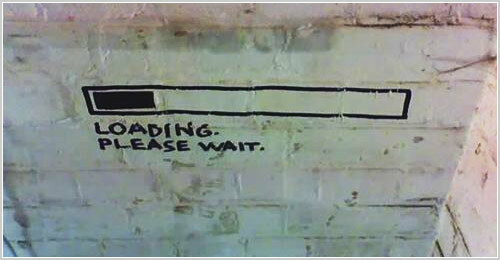 Please wait… and wait, and wait, and wait. Picture courtesy of Couch media. Yes, we’re waiting, but the **** thing isn’t moving! Do they also come with Ethernet and Wireless? Ok, so it doesn’t say LOVE. It says AMOR, Spanish for love. We’re based in Sweden, home of the Vikings, so of course we like runes! 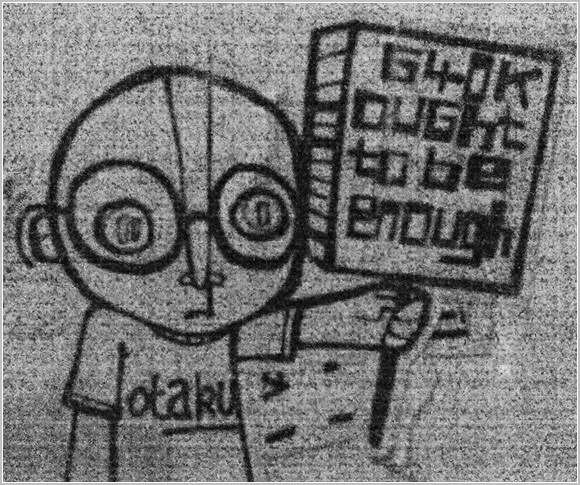 Especially when they are as geeky as these. 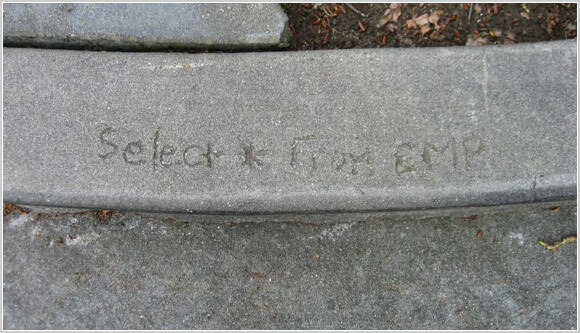 Given the SQL theme, it should come as no big surprise that these carvings were found on the Oracle campus. Who would ever need more than 640k? Based on the famous quote by Bill Gates (which apparently never happened). Someone really doesn’t like Windows. 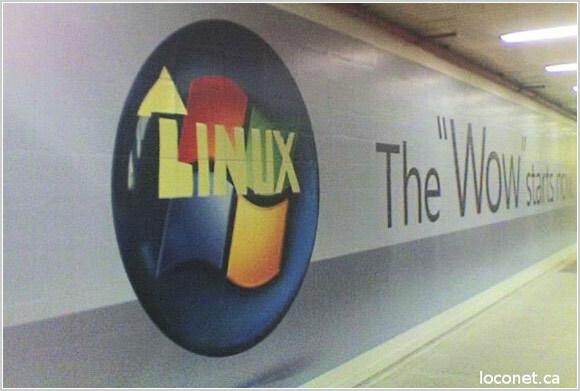 Considering how much Windows advertising there exists, this Linux guy has his work cut out for him. We thought this one was funny. Techs vs. No-techs. The West Side Story of Silicon Valley? Found in Berlin. Geeks are (luckily enough) found everywhere. Which the following pic clearly shows. 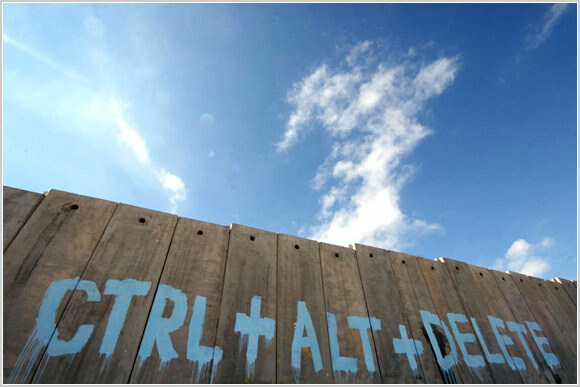 This is the West Bank wall in Palestine. Someone wishes for a reboot. Isn’t that a thing of beauty? Metaphors all over the place in this geek style poetry. Self irony? Or truth? Who knows. 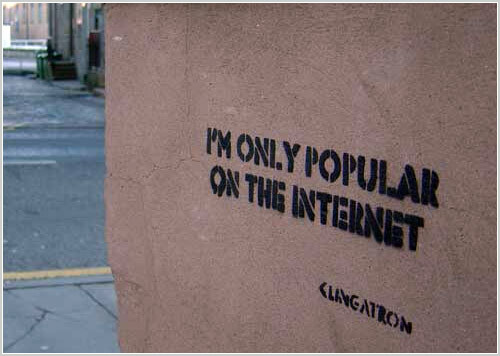 Klingatron at least seems to be a real artist, based in Glasgow, Scotland. He even has a website. Hope you liked these pictures as much as we did. the one on the Palestinian side is about 2 kilometers away from my home , just fantastic ! Found some wet cement, I couldn’t resist! I love the ‘404’ message on a grate. I used to work for a start-up that went into a death spiral and left a smoking crater. On the way down, the employees found out that our 401(k) contributions were being kept by the company. In the angry meeting that ensued, some of the technies started referring to their “404(k) accounts”. The CFO never really did get the joke. 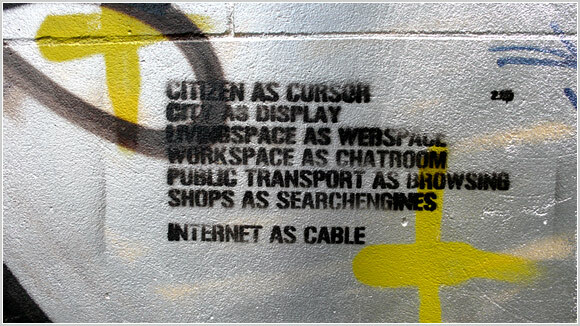 The CTRL+ALT+DELETE one is Banksy. 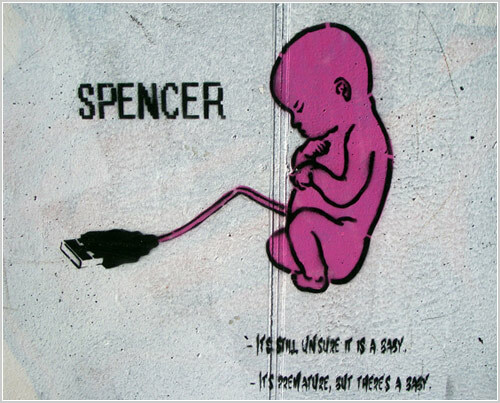 The ‘spencer’ one is Banksy, I doubt he’d go to palestine just to paint on a fence! He uses spray paint anyway! Geeks leaving the house… unprecedented! 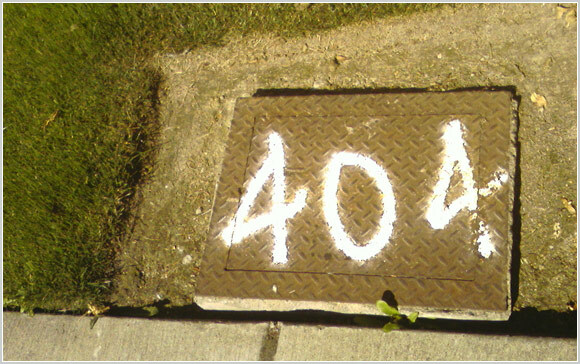 I think you misunderstood the 404 one — the grate is there, it’s the GRASS that is missing. A rectangular plot of dirt in a the middle of a lawn obviously implies that that grass tile has failed to download. 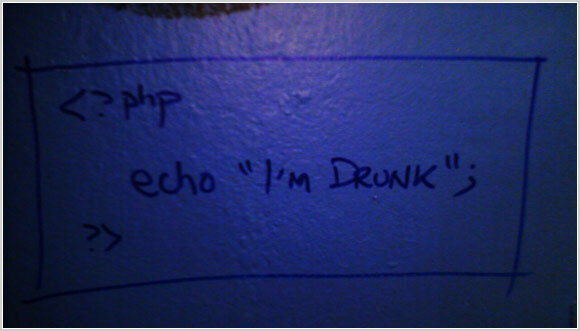 Love the PHP that says, “I’m Drunk” Haha!! x3 awesome! the Loading screen picture was uber cool! Saw an Awesome “Ctrl Z” instead of a “Sorry” painted on the wall the other day!